“Outlander Photo Round-Up Includes Reading, Riding And A Really Bloody Claire,” by Kelly West for the Television Blend feature at CinemaBlend.com. Article about newly released images from the set of the TV series. At right is one of the newly released Starz images, of Claire reading (portrayed by Catriona Balfe). Article released on February 25, 2014. Outlander’s Maril Davis Q & A – Lots and Lots! by Erin Conrad, for ThreeIfBySpace.com. Series co-producer Maril Davis, of Tall Ship Productions, answers lots and lots of questions about filming and the set on Twitter, which are recounted in this article. Article posted on February 23, 2014. “Jamie Frasier Gets His Wounds Dressed In New Outlander Photo,” by Kelly West, for the Television Blend feature on CinemaBlend.com. Happy Valentine’s Day! What celebrates the day better for many of us than a handsome man with no shirt on? This article discusses the image (shown at the top of this page) which was released on the Starz network’s Outlander Facebook page. It shows Jamie Frasier (actor Sam Heughan) being tended to by a mystery woman, which is most likely Claire (actor Catriona Balfe). Released on February 14, 2014. 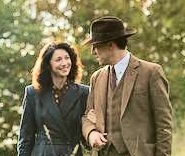 “Outlander Photo Shows Claire And Frank, Ronald Moore Comments On Game Of Thrones Comparisons,” by Kelly West, for the Television Blend feature on CinemaBlend.com. The article features a new still image of Claire and Frank Randall (actors Catriona Balfe and Tobias Menzies) from the new Outlander TV series. Also discusses the interview with Ron Moore (listed below) in which Outlander and Game of Thrones are compared. Posted on Thursday, February 13, 2014. “Ron Moore on Adapting ‘Outlander,’ Helix’s Future and Taking on James Bond, by Leslie Goldberg, of The Hollywood Reporter. An interview with Ron Moore, who discusses his current projects. Does Ron agree that the Outlander TV series is the Game of Thrones for women? Is he planning to cover one of Diana’s books per season in the TV series? Read this article and find out! Interview published on Wednesday, February 12, 2014. “Outlander Scoop: Author Diana Gabaldon To Cameo,” by Lynette Rice, in an exclusive story for Entertainment Weekly’s “Inside TV” feature. Diana is not just an extra in the background — she has a couple of lines! The scene was filmed during the first week of February when she visited the sets in Scotland. This story posted on Saturday, February 8, 2014. 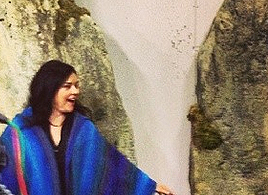 Image at right: Diana on the stones set in Scotland in early February. Click here for more photos. View images of Diana on the Outlander TV series set, originally posted by Starz on Instagram. Released on January 31, 2013. This page last updated on Monday, August 4, 2014 at 6:00 p.m. (PDT).